I was about to finish my cooking for the day when my eyes fell on the brown spotted bananas, sitting and staring at me from the kitchen countertop waiting to be used. "Balala" [that's how my younger one asks for his favourite fruit] provide energy and nutrition and we often buy them for kids, they being convenient as a grab and go snack option when compared to chips and wafers. But sometimes these bananas get spotted so fast and too ripe that kids refuse to even look at them. Instead of throwing them, I prefer to prepare Mangalore buns [deep fried puris using these type of ripe bananas] and the times when I don't want to deep fry then I use them to make shikran/ halwa or paratha. 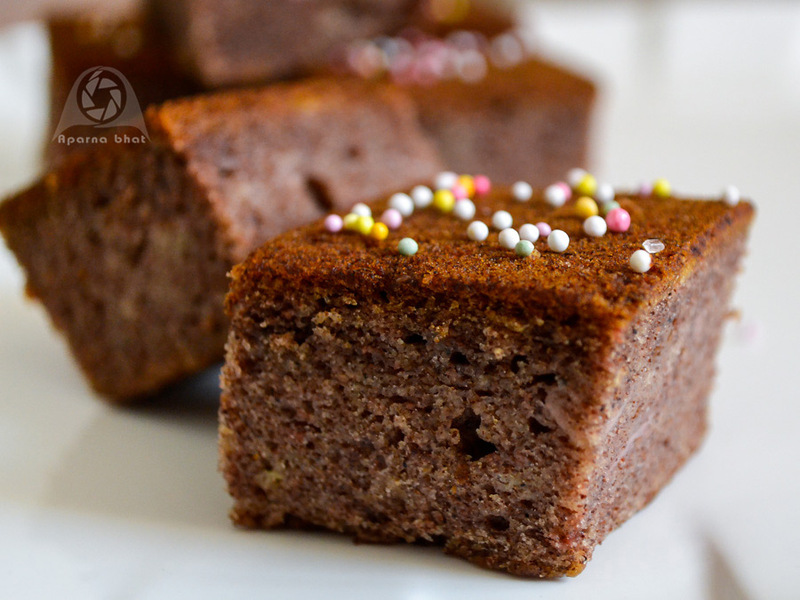 As I finished my cooking, flipped through my recipe notes and came across a recipe shared by Sahana on facebook few months back - an eggless cake using ragi flour and mango pulp. Baking with bananas ..a cake or may be a bread was in my mind since long time. 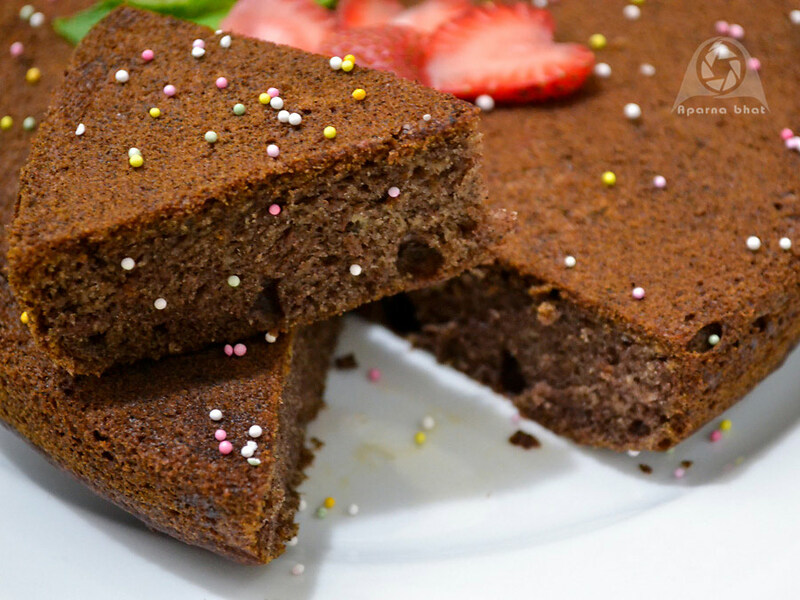 While browsing through the net I came across a similar cake recipe on Lite Bite by Sanjeeta. A reader had left a comment on Sanjeeta's page about using bananas instead of mango pulp in the recipe. Ta ta da ... there I was super excited to discover another excellent way to use these overripe bananas and turn them into healthy baked treat. Thanks Sahana for sharing your recipe. Sift the flours and powders. Mix the dry ingredients in a wide mixing bowl. Keep them aside. Preheat the oven at 190 degrees for 10 minutes. Grease the baking pan and keep it ready. In another bowl, take oil. Add sugar and whisk the mixture gently till sugar dissolves. Add yogurt, mashed banana and whisk it well. Add the wet ingredients to the dry ingredients little at a time and fold in gently, taking care to remove the lumps if any. Add vinegar and mix it well. Pour the cake batter into greased and dusted baking pan [here I have used a heart shaped pan] and bake it at 190 degree C for 25-30 minutes or till done [the toothpick inserted in the center comes out clean]. Allow it to cool down on cooling rack, place it it on the serving tray/plate. Decorate as per your choice, slice and serve it. Kids enjoyed this sweet treat and kept asking for more !!! 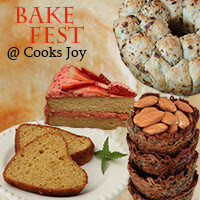 Sending this post to Bake Fest event hosted on Sweet'n'Savoury by Amritha , an event started by Vardhini of Cook's Joy. 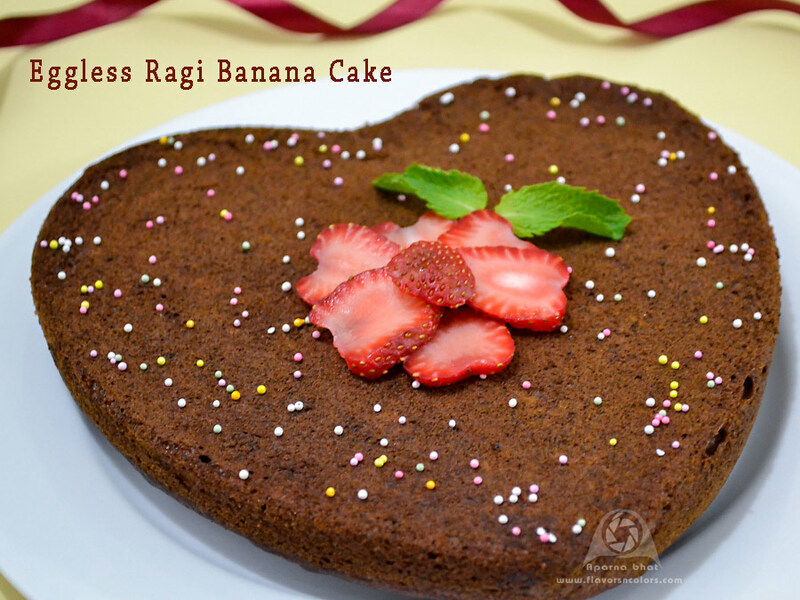 Wow, I have never tried using Ragi flour to bake a cake. This must be the healthiest cake. Loved the recipe and the pics. Thank you for linking. Lovely! I too love mixing up flours in cakes! A healthy and lovely cake! Surely worth a try. Thanks for sharing.